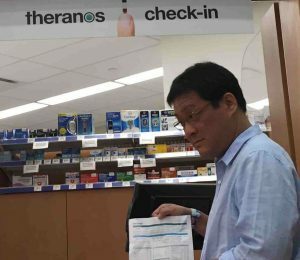 Last year, I went on a road trip to San Francisco and having heard about the disruptive future-tech of Theranos, I decided to take a detour to the Palo Alto Walgreens to have my blood tested by the next generation tech innovation and blogged about it. 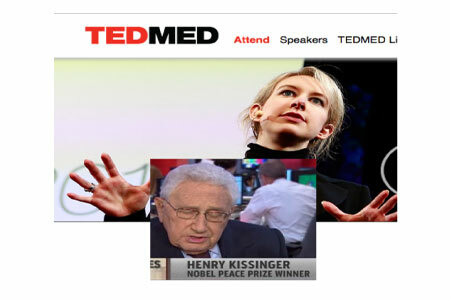 I was lured by CEO/Founder Elizabeth Holmes’ and her 2014 TEDMED talk, viewed over 400,000 times, in which she conflates human rights, tech innovation, and Theranos’ business model as disruption as the way forward. I thought that if she raises billions, gets heavyweights like Henry Kissinger on her board, and kills it in her TED Talk, that what she provides is legit. I was surprised that the company’s EDISON tech, which allegedly did things better with less blood, still required the team to draw six big tubes of blood. Perhaps that might have warned me that a former employees were about to blow the whistle on how bogus the claims were. 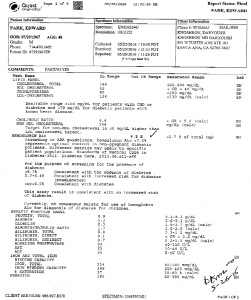 My own results were worrisome with an elevated ferratin, triglycerides, cholesterol, hemglobin A1c, and liver functions. 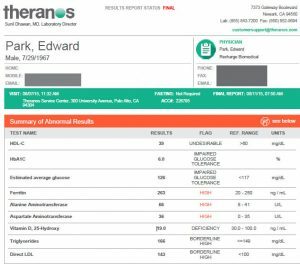 It turns out that Theranos was sending most of their blood tests to the old tech competitors that they claim to excel over. Were my tests even reliable? Maybe not according to their recanting of 2 years of results. I just repeated the tests during my cancer scare workup two weeks ago and they were all normal except for a slightly elevated Hb1C (prob from my daily intake of lattes, donuts, and croissants). So what is the message here? Perhaps we should be a bit careful when thought leaders promise to deliver something different and better. I recognize that there are many people who trust me and that is something I take very seriously. I like what a newsletter reader said to me “I may not agree and you may be wrong, but I know you are being honest.” That is the best compliment that I could hope for. I recently gave out about eight cards at The Who Concert VIP reception and nobody seemed interested because they didn’t know me. On the other hand, there are many people who take TA-65 or my supplement, RECHARGE, and despite the costs, they won’t stop because they feel better and have compared life while taking and not taking and understood the benefits. Are blood tests even helpful? I think what we need to understand is that they are an indirect measure of cellular health and function. Someday, we will have a way to assess the cellular genetic and functional integrity and replace damaged cell niches. Until then, we have to depend on the lab companies of the world to act with integrity. If you want to see just how easily we are manipulated by the lure of “thought leaders” then watch this amazing, funny and spot on presentation meta-talks where the style, devoid of substance, informs and becomes the message itself.